Text from The History of the Sierra Club: 1892-1970, by Michael P. Cohen, published by Sierra Club Books in 1988. Years before the founding of the Sierra Club, many of its future leaders and supporters were traveling the mountains of California and sharing with others the wonders they found there. Muir was chief among these early wilderness explorers and visionaries. An immigrant who had been raised on a Wisconsin farm and educated at the University of Wisconsin, Muir had arrived in California in 1868 planning to stay only a few months before setting off to study Amazon botany. Virtually penniless, he hired on as a shepherd's assistant, a job that took him to Yosemite Valley--and ultimately changed his life. "I have run wild," he later wrote of the effects of Yosemite's rugged grandeur. "As long as I live," he wrote, "I'll hear waterfalls and birds and winds sing. I'll interpret the rocks, learn the language of flood, storm, and the avalanche. I'll acquaint myself with the glaciers and wild gardens, and get as near the heart of the world as I can." "This was my 'method of study,'" he recalled later, "I drifted about from rock to rock, from stream to stream, from grove to grove. Where night found me, there I camped. When I discovered a new plant, I sat down beside it for a minute or a day, to make its acquaintance and hear what it had to tell... I asked the boulders I met, whence they came and whither they were going." For much of the next decade John Muir made the incomparable Yosemite Valley the center of his experience, becoming well-known among visitors for his tales of travel in what he called "the range of light." Soon his words reached the larger audience of the New York Tribune and other influential publications, and he was writing that the Sierra should be explored by everyone with "the right manners of the wilderness," and permanently protected as a recreational resource accessible to all. Ralph Waldo Emerson visited Yosemite in 1871. Muir introduced himself and attempted to spirit the aging philosopher away from his literary entourage, to camp for a night beneath the sequoias. But, as Muir observed, "the house habit was not to be overcome." Nevertheless, the two men did converse while on a day walk, and the next year Emerson wrote in hope that Muir's "probation and sequestration in the solitudes and snows had reached their term," suggesting that it was time to enter society. Although Muir was moved by this plea, he did not leave Yosemite. Instead he responded to what historian Kevin Starr has called "a deep California hope: that a regional heritage could be defined and preserved." Muir's commerce in the 1870s was with the mountains, and his voice gave shape to what Starr calls a "distinctly Californian relationship to the outdoors." For Muir, this relationship was often enjoyed in solitude. He once wrote that "no mountaineer is truly free who is trammelled with friend or servant, who has the care of more than two legs." But as he did with Emerson, Muir also sought communal outings. In 1870 he joined a party of students from the University of California that included Professor Joseph LeConte, Sr. LeConte had been invited on this student excursion at the end of spring term because he was, as Sierra Club historian Francis Farquhar wrote, "the very ideal of the college professor, and his students felt for him an admiration only surpassed by their admiration for his scholarship." One August evening, sitting in the moonlight above Tenaya Lake in what is now Yosemite National Park, LeConte and Muir were struck silent by the wonder of the place. As LeConte remembered, the stillness of the evening, the shadows of the mountains, the glittering of the ruffled water, "all these seemed exquisitely harmonized with one another and the grand harmony made answering music in our hearts." It was a moment, and a place, that LeConte would not forget. 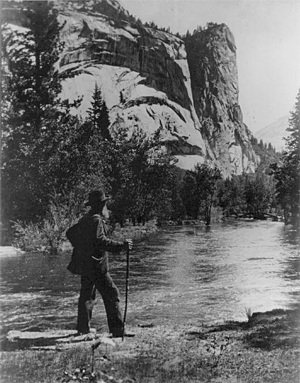 In 1889 Muir embarked on an excursion in northern Yosemite with Robert Underwood Johnson, editor of the influential Century Magazine. Sitting around a campfire at Soda Springs in Tuolumne Meadows, the two planned a campaign for a Yosemite National Park--a campaign that succeeded the following year when Congress established the park. But Muir and Johnson soon realized that an organization would be necessary to ensure Yosemite's protection. At the same time, a group at the University of California, led by J. Henry Senger, was interested in promoting recreation by making the Sierra--and especially the Yosemite region--more accessible and better known. Muir joined these and others in the San Francisco Bay Area who were interested in creating an alpine club. Among the organizers were the artist William Keith, attorney Warren Olney, professors LeConte, Senger, and Cornelius Beach Bradley, and Stanford University President David Starr Jordan. Olney and Senger drew up articles of incorporation. On May 28, 1892, in a meeting at Olney's office in San Francisco, the Sierra Club was incorporated "to explore, enjoy, and render accessible the mountain regions of the Pacific Coast; to publish authentic information concerning them," and "to enlist the support and cooperation of the people and government in preserving the forests and other natural features of the Sierra Nevada." These three purposes, recreational, educational, and conservationist, constituted the Club's motives, means, and final object. Many of the Sierra Club's 182 charter members were scientists; consequently the scientific exploration of the Sierra was vigorously pursued by the organization in the 1890s. Among the Club's first publications were Joseph LeConte's maps of the range. Bolton Brown scouted the area from Mt. Williamson to Mt. Clarence King in the southern Sierra. Walter Starr, Allen Chickering, and Theodore Solomons mapped and photographed the Sierra crest from the Merced to the Kings rivers. The Sierra Club Bulletin (first published in 1893 and continuing today as Sierra) included reports of excursions, guides to Sierran geography, and scientific papers on the range's natural history. Stanford Professor William Russel Dudley wrote regular columns on forestry. Likewise, Club-sponsored events furthered the organization's educational purposes. In its early years, the Club shared offices with the California Academy of Sciences and the Geographical Society of the Pacific, wherein it often sponsored public educational and scientific meetings. John Wesley Powell, chief of the United States Geological Survey, lectured in 1892 on his exploration of the Grand Canyon of the Colorado River, and in 1895 the Club sponsored a discussion of "The National Parks and Forest Reservations," including addresses by Muir, LeConte, and Dudley. Recognizing a need to extend its educational activities beyond San Francisco, the Club established an information center for visitors to Yosemite Valley in 1898. The center included a library, and a young man named William Colby was hired as its attendant. In 1903 the Club completed the LeConte Memorial Lodge in Yosemite to serve as the organization's summer headquarters. This was the first of many lodges, information centers, and trailside shelters that the Club would build and staff. Fueled by the interest of its city-based members in the mountains, the Sierra Club was growing, but slowly. Eight years after the inaugural meeting in Olney's office, membership numbered 384. Aware of the significance of numbers in politics, Muir became a booster of tourism. He reasoned that "if people in general could be got into the woods, even for once, to hear the trees speak for themselves, all difficulties in the way of forest preservation would vanish." The more who would kick Emerson's "house habit," the better for the cause of conservation. By 1901 the Club's Board of Directors had determined that an annual summer outing would be a valuable addition to Club activities. Other organizations, such as the Mazamas in Oregon and the Appalachian Mountain Club, engaged in annual outings, but their aims were purely recreational. Viewed in terms of the goals of the Club, outings would encourage members and other interested people to see firsthand the country the Club sought to preserve. This was no small task at a time when simply reaching the Sierra from San Francisco, many miles distant, required a major effort. While many of the early explorers of the Sierra were Club members, some members had never visited the range and could have little knowledge of Muir's "right manners of the wilderness." William Colby was the man who undertook to teach them. A graduate of the University of California's Hastings Law School, Colby became Secretary of the Sierra Club in 1900, retaining that position for 46 years, with the exception of the two years he served as President. Colby probably became closer to Muir than any other Club member, and he was Muir's steadfast comrade in the campaign to preserve Hetch Hetchy Valley in Yosemite National Park. For the outings, Colby had Muir's strong support, and the help of Edward Parsons, who had planned similar ventures for the Mazamas. "An excursion of this sort," Colby said, "if properly conducted, will do an infinite amount of good toward awakening the proper kind of interest in the forests and other natural features of our mountains, and will also tend to create a spirit of good fellowship among our members." At the same time, Colby recognized the necessity of compromise if outings were to initiate novices into the wilderness. He recommended that the trips "combine comparative ease and comfort with the opportunity to see some of the grandest scenery of the Sierra, not too commonly visited as to lack distinction." He also knew that it was necessary to keep the cost of the excursions low; the typical Sierra Club member was of the middle class, and early participants on outings were often college students. (In fact, Colby frequently ran deficits on outings, which he made up out of his own pocket.) He chose Tuolumne Meadows for the first Sierra Club outing, camping at Soda Springs, where Muir and Johnson had laid plans for the campaign to establish Yosemite National Park. The first outing was the model for what came to be called the High Trip. Run nearly every summer for more than 50 years as the Club's chief cultural event, the High Trips were not small excursions: 96 people went to Tuolumne Meadows in 1901, more to Kings Canyon the next summer, and the annual number of participants would grow to 200. In the early days a camp was established in a central location, and meals were prepared at a commissary. Camp equipment was transported first by wagon, later by mule-train, and the participants usually walked alongside. They also walked up mountains. On the first trip, 49 Club members hiked 20 miles and ascended 4,000 feet to the summit of Mt. Dana in one day. Twenty climbed Mt. Lyell, the highest peak in Yosemite National Park. The next year's Bulletin carried two reports of the summer outing, one by Ella Sexton, subtitled "a woman's view of the outing," and the other the "man's view" -- written by Edward Parsons. Parsons noted of the women who ascended Mt. Dana, most of them "Berkeley or Stanford girls," that "their vigor and endurance were a revelation to all of us." With their focus on community and recreation, the outings produced a very different atmosphere from the camps of the gold miners or those of the geologic explorers of the nineteenth century. This was in part because women established themselves at once as active participants in the Club's activities. One such woman was Marion Randall. A close friend of Muir's daughter Wanda, Randall joined the 1904 outing as her first venture into the wilderness. Of that experience she wrote, "It sounds rather alarming at first--to camp for a month with a party of 150 persons, strangers for the greater part." Yet she found that the "crowd" somehow became a community, and the name of the Club "has come to mean an ideal for us. It means comradeship and chivalry, simplicity and joyousness, and the carefree life of the open." Randall joined that community; three years after her first Club outing she married Edward Parsons, and served as a Club Director from 1914 to 1938. Colby's idea worked, and he continued to lead annual outings for 29 years. After he retired from leading, his ideal was still working in 1948 when young Club member Peggy Wayburn joined a High Trip for her first wilderness adventure. "The love of the wilderness had entered into me," she wrote of the effect of that trip. "I was, and forever would be, one of John Muir's disciples." A disciple of John Muir was, in his terms, "hopelessly and forever a mountaineer," and Club members found plenty of mountains to climb. In 1902 Muir led a group of campers from the annual outing to the summit of Mt. Whitney. In 1903 a large Club party ascended Mt. Williamson, and 139 people in two parties climbed Mt. Whitney. In 1905, 56 members of the annual outing, including 15 women, made the ascent of Mt. Rainier, on the first High Trip outside California. Stephen Mather was among the party; he later became the first director of the National Park Service, where he used wilderness outings to promote proposed parks to influential citizens and members of Congress. Sierra Club outings were never simply hiking trips. Before the first outing, campers were advised to read Muir's The Mountains of California and LeConte's Ramblings Through the High Sierra. Once the trip was underway, William Dudley lectured on forestry, C. Hart Merrian taught biology, Theodore Hittell discussed the history of Yosemite, and Muir spoke on geomorphology. On the 1904 excursion, Harriet Monroe, the poet from Chicago who began Poetry magazine, recited her satirical poem, "The Ballad of Ritter Mountain." She wrote and produced a play, Idyll of the Forest, for the 1908 outing. Such lighthearted interest in art continued; Ansel Adams wrote and produced The Trudgin' Woman and Exhaustos, performed during the 1931 High Trip. And each year the outings succeeded by recruiting new Sierra Club members to "hear the trees speak for themselves." The value of building Sierra Club membership became clear as development increasingly threatened the wilderness. The vast Sierra Forest Reserve, initially thought inviolable, had been opened to logging and sheep grazing, and in 1914 the Club conducted its last outing to Hetch Hetchy Valley before it was flooded by a reservoir. Muir died that Christmas Eve; some thought his heart was broken by the loss of this majestic canyon on the Tuoloumne River. In the same year, automobiles first entered Yosemite Valley, and with them began the modern era of industrial tourism, presaging future conflicts for the Club. In the meantime, modern means of transportation allowed participants on the High Trips easier access to mountains even farther away. In the 1920s High Trips visited Glacier National Park in Montana. Yellowstone National Park in Wyoming, and Jasper and Mt. Robson parks in Canada. But Club members conducted their outings primarily in the Sierra, familiarizing themselves with the region they felt an obligation to know, protect, and preserve as a recreational resource. As Club members explored the Sierra, opening new routes and leading outings, they advocated a system of trails to improve access to the backcountry of the range. After Muir's death, the Club promoted creation of a trail in his name along the Sierra crest, connecting Yosemite with Mt. Whitney. The Club obtained appropriations from the California Legislature and did much of the exploration and planning; even before the trail was completed in 1938, the Club published Walter Starr's Guide to the John Muir Trail, and it has keep the book in print ever since. By the early 1930s the Club could look back and see that much of its work in rendering the Sierra accessible had been accomplished. Travelers throughout the range referred to Club-produced maps and guides, and they hiked trails built by Club labor. The organization had overcome the "house Habit" among its members and introduced a significant number of people to the wilderness, in the process establishing an outings program that solidified the traditions necessary to a communal spirit. The outings had such symbols as the Sierra Club cup and the bandanna, used, according to the first Sierra Club Handbook, "as towel, sunsuit, lunch bag, neckerchief, wash cloth, creel, headdress, apron, scarf, pot holder, terminal protection in case of torn pants, first aid bandage." Outings had produced songs, jokes, poems, plays, and a common sense of purpose. Meanwhile, climbers from the High Trips were attempting and achieving more difficult ascents in the Sierra. The level of technical achievement moved forward as major peaks were climbed and new routes explored by such men as Duncan McDuffie, Francis Farquhar, Walter Starr, and Walter Huber. A pattern became established in which respected outings leaders became Directors and officers of the Club. The annual High Trip served as a training ground for emerging leaders of the organization. In 1930 William Colby led his last High Trip. To Marion Randall Parsons, the end of the Colby-led outings seemed like the end of an era. "Our problem is no longer how to make the mountains better traveled and better known," she wrote that year. She wondered whether the Club needed to restate its aims for a modern age. In fact, the Club was already changing. The Angeles Chapter had been chartered in 1911, the San Francisco Bay Chapter in 1924, the Riverside Chapter in 1932, with many more to come. The first chapter outside of California--the Atlantic, organized by Tom Jukes to serve members on the East Coast--would be chartered in 1950. Each chapter began to provide its own educational and outings programs. The year 1931 brought to the Club a major technological innovation that promised to change the nature of mountaineering. On the High Trip to northern Yosemite, Francis Farquhar, with Robert L. M. Underhill of the Appalachian Mountain Club, introduced the proper use of the climbing rope to Club mountaineers. Immediately after the annual outing, Underhill joined Norman Clyde, the grand old man of the Sierra, and two younger climbers, Glen Dawson and Jules Eichorn, in the first ascent of the east face of Mt. Whitney. Other difficult first ascents were made that summer, including the north face of Unicorn Peak, North Palisade, Thunderbolt Peak from the glacier, and the east face of Banner Peak. The use of the climbing rope energized the climbing community. A young law student named Richard Leonard organized a climbing club that practiced at Cragmont Rock in Berkeley; this group became the Rock Climbing Section of the San Francisco Bay Chapter. A similar section was formed in the Angeles Chapter. Soon members of the rock climbing sections were training for difficult technical ascents in Yosemite and at Tahquitz Rock in southern California. A new generation of Club rock climbers appeared, including Leonard, Eichorn, David Brower, Raffi Bedayn, Morgan Harris, Bestor Robinson, and many others. Although Club members did not introduce the use of the rope to American climbers, they perfected its use, promoted safety in the sport, and raised the standards for technical climbing. By the mid-1930s they were pioneering routes up spires, walls, mountains, and towers previously thought unclimbable. In 1934 Eichorn, Leonard, and Robinson climbed the Cathedral Spires in Yosemite, using pitons for the first time in the Sierra. The Club's Committee on Mountain Records began to compile a climbing guide to the Sierra, and the Sierra Club Decimal Rating System, developed at Tahquitz Rock by the Angeles Chapter Rock Climbing Section, soon became the American standard for determining the difficulty of rock climbs. The Club's Bulletin had been devoted primarily to literature about the exploration, enjoyment, and conservation of the Sierra; under the editorship of Francis Farquhar it also became the premier American mountaineering journal. Club expeditions went to British Columbia in the mid-1930s, and by the 1950s successful Club-sponsored expeditions were going to Alaska, Peru, and the Himalayas. Sierra Club climbers and Club-trained climbers would become the avant-garde of American mountaineering in the next three decades, and they would make California--in particular Yosemite Valley--an international center where technical climbing reached ever-higher standards. Meanwhile, rock-climbing sections in individual chapters instructed novices in safe technique and devised tests to screen participants for climbs of various levels of difficulty. From these local sections came a constant flow of accomplished mountaineers. Skiing had always been the companion sport to summer mountaineering. The best-known early skier in the Sierra was "Snowshoe" Thomson, who crossed the Sierra many times in the mid-nineteenth century. Muir himself skied at Lake Tahoe in 1878. Some Club members had been interested in skiing from the beginning, and in 1915 Hazel King had written for the Bulletin of her "wonderful flight on hickory wings" at Tahoe. Like climbing, ski technique underwent a revolution in the 1930s. During the winter of 1929-30, Club member Orland Bartholomew solo-skied the crest of the Sierra from Lone Pine to Yosemite Valley. Francis Farquhar wrote in the Bulletin that such an accomplishment opened up a new era, allowing winter ascents of major Sierra peaks and the unfolding of the winter grandeur of the range. Another writer for the Bulletin prophesized that "within a very few years there will be found in the Sierra Nevada of California the outstanding winter resorts of America." Club President Duncan McDuffie appointed a Winter Sports Committee, chaired by the young photographer Ansel Adams. This committee urged the Club to eschew the exploitation of downhill resort skiing, and instead to encourage winter cross-country trips and expeditions. Meanwhile, Joel Hildebrand, a chemistry professor at the University of California, was interested in encouraging technical proficiency (and perhaps competition) among skiers. Hildebrand and others devised downhill skiing tests that screened Club members for tours of increasing difficulty, and awarded badges corresponding to various levels of proficiency. These tests were supplemented by a ski-mountaineering test that focused on backcountry-touring and winter-camping technique. The widespread enthusiasm for winter sports led the Club to build ski lodges. In 1930 the Angeles Chapter constructed Harwood Lodge in San Antonio Canyon, and a few years later the chapter built San Antonio Hut and Keller Peak Ski Lodge. Skiers from the San Francisco Bay Area built Clair Tappaan Lodge near Donner Summit in 1934, and others followed. The Club began to schedule winter outings that used the lodges as centers for tours. World War II forced a temporary halt to the Club's outings program, but actually served to further Club members' progress in developing mountaineering equipment and technique. During the war, many Club leaders saw combat with the U.S. Mountain Troops, while others perfected equipment and trained troops. Indeed, the Manual of Ski Mountaineering, a collection of articles on winter camping and safe mountaineering written by Club members and edited by David Brower, was compiled to aid in training mountain troops. And much of the Army manual, Mountain Operations, was drawn from Sierra Club mountaineering experience. The 1940s also saw the introduction of nylon climbing rope by Richard Leonard, and improved technology of expansion anchors, first used on a Sierra Club party's ascent of Ship Rock in New Mexico. The advent of new alloys allowed advances in the design of pitons. But technology influenced more than the frontier of technical climbing and skiing; "mummy"-style sleeping bags, devised and tested by Club mountaineers, nylon tents, and improved backpacks using aluminum frames made travel in the mountains far less arduous than it had been at the turn of the century, opening the wilderness to more people. For most of the first four decades of the twentieth century, the Sierra Club encouraged and developed new and more sophisticated techniques for wilderness recreation. In the 1930s Club members began to discuss the right uses for this technology. For instance, David Brower criticized skiers who "admired their apparel, while the peaks went unnoticed . . . Now men ski superbly," he wrote, "but what have they lost?" Ski resorts were, after all, practice slopes for something better. In a similar vein, Ansel Adams warned that "the mountains are more to us than a mere proving ground of strength and alert skill. Rock climbing should be considered a thrilling means to a more important end." This matter of recreational philosophy was rooted in the beliefs of Muir, who distinguished sharply between conquest and true recreation, and the technical and spiritual. The purpose of climbing mountains, Muir had argued, was not simply to become a great athlete, but to "get their good tidings," and to gain insight from the experience. This discussion of recreational philosophy affected the Club's outings program. By the late 1930s the High Trip had grown so large that many members desired smaller, more intimate groups, and they responded enthusiastically to the idea of new types of outings. Under the auspices of Richard Leonard, who became chair of the Outing Committee in 1936, outings were diversified. First came the Burro Trips in 1938, begun by Joel Hildebrand's son, Milton. These permitted a more leisurely experience for families with small children, and allowed participants more complete self-reliance. On Knapsack Trips, begun by David Brower in the same year, participants carried their own food and equipment, were most independent, and were easier on the mountain environment. Two years later Oliver Kehrlein organized Base Camps; participants traveled to one place, where they stayed for two weeks and were cared for by a professional staff, in the High Trip tradition. Yet the High Trip remained the central Club occasion. It was, as Brower remembers, "the best source of the conservation warrior." There were also environmental reasons for the Club to begin its transition away from the large High Trips toward smaller, more diversified outings. During the era of the Colby High Trips it was the general view that nobody else was in the wilderness. As that became less true in the 1930s and after World War II, the Club became concerned that its large groups were disturbing the other visitors to the mountains. Before the war, the National Park Service began to study deterioration of Sierra mountain meadows as a result of the use of pack stock. And in 1947 Richard Leonard coauthored the article "Protecting Mountain Meadows" with Lowell Sumner, an influential Park Service biologist. Although this article pointed out that the Club had been careful with pack stock, and was not "loving the mountains to death," the writing was on the wall. Large parties using many pack animals would increasingly become a problem, even in the spacious backcountry of the Sierra. As a corollary to this concern over the impacts of backcountry recreation, the Club became increasingly concerned with federal management of wildlands. Club Director and professional wilderness packer Norman "Ike" Livermore, Jr., proposed that the Club conduct a wilderness conference to bring together administrators and users of California's wild country. Held in 1949, the conference was attended by about 100 federal and state land managers, outing leaders, and professional outfitters and guides. Its success led to the biennial Wilderness Conferences, which continued for more than two decades and greatly influenced conservation policy. As wilderness recreation expanded in the postwar years, so did the potential for development to mar wildlands to an extent little imagined a few years earlier. One result of this was that many members became concerned that Club purposes had not kept up with changes in the Sierra. To these members, the phrase in the Club's statement of purpose that read "to . . . render accessible the mountain regions" seemed fitting to the horse-and-buggy era in which the High Trips had been started, but inappropriate to a time when engineers were planning roads throughout the mountains and hikers could be encountered in every wildland. Even if only by trail, increased access implied not only crowding in the mountains and deterioration of the wilderness experience, as the Bulletin noted in an article called "Yosemite's Fatal Beauty," but also the potential deterioration of the environment itself. It was at this point that the so-called "Young Turks," such people as David Brower, Richard Leonard, Ansel Adams, Charlotte Mauk, Harold Bradley, and others began to challenge the philosophy of William Colby, who believed that the more visitors to the Sierra, the better. Colby argued that the Club had faithfully followed Muir's ideas both when it advocated new trails and when it participated in the planning of new or improved roads. Now, the Young Turks argued, the emphasis of the Club needed to shift; it was no longer so difficult to reach the backcountry, and technology had eased the burden of wilderness travel. This argument was first raised in opposition to proposed new roads into Kings Canyon National Park and the "improvement" of the Tioga Road in Yosemite National Park. In 1951 the Board of Directors recommended that the Club's statement of purpose be revised from "explore, enjoy and render accessible . . ." to "explore, enjoy and preserve the Sierra Nevada and other scenic resources of the United States." Soon after, this change was approved by the membership. Because conservation, education, and recreation were linked, this change in Club purpose was reflected in the nature of the Club's outings over the next decades. Outings weren't curtailed, but they were controlled. The High Trip continued, yet increased attention was paid to "minimum impact" camping. Going Light--With Backpack or Burro, edited by Brower, was published by the Club in 1951. Individual Club outings grew smaller, more self-reliant, and more varied during the 1950s and 1960s, while the total number of people participating in the outings increased dramatically. As the Club's conservation interests extended beyond California, outings were scheduled to wilderness areas of national importance, such as the North Cascades in Washington, the Sawtooths in Idaho, and the Wind River Range in Wyoming. In a particularly important development, when Dinosaur National Monument was threatened by federal plans to build a dam at Echo Park in the early 1950s, David Brower and Harold Bradley urged the Outing Committee to plan a river trip to Dinosaur's spectacular canyons. With the development of flat-bottomed inflatable rafts, large numbers of people could be transported by a few experienced boatmen. Three one-week trips were scheduled by Outings Chairman Stewart Kimball, each taking 65 people down the Yampa and Green canyons, the heart of the monument. Families with small children went on these expeditions, demonstrating that, with precautions, rafting could be a safe and universal recreational experience. More important, though only 13,000 people visited the monument in 1950, with fewer than 50 rafting the rivers, in 1954 nearly 71,000 visitors appeared and more than 900 floated down the canyons. These river trips took influential people to this endangered wildland, allowing them to see the monument in a way that was not otherwise available, and might never again be possible if Echo Park Dam were built. This was the traditional Club strategy with regard to outings--utilizing new technologies while encouraging appropriate recreational use in a threatened wilderness. Outings had their effect, as Muir had argued, when travelers came back from the wilderness ready to fight for its preservation. David Brower has called this the "place no one knew" strategy. There is nobody to protect a place nobody knows. More outings would be organized for the wild rivers of the Colorado Plateau of Utah, and in the Grand Canyon in the 1960s to build opposition to dams that were planned there. A river-touring section began in the San Francisco Bay Area, and the coming decades saw increased national interest in enjoying and preserving rivers all across the continent. "Not to escape from but to escape to: not to forget but to remember. We've been taking care of ourselves in places where it really matters. The next step is to take care of the places that really matter."